Now there's a team that wants to inspire to really get the most out of their stats. 3 Range firepower across the entire team and some potent cleave on shooting for Lund and Inspired Thundrik. Really liking the objectives they showed off too. Headshot might have you cursing the dice gods, but the odds of landing a crit before the action phase is over should be pretty good. Focus Fire should also be pretty reliable unless you're exclusively shooting 2 wound fighters and never missing. The one gear they showed off appears underwhelming. Fighter specific upgrades usually have to be pretty damn great and/or for a linchpin fighter in order to be worth it. I don't think Rapid Reload is going to make the cut in most decks. The gambits are a mixed bag. Timed Charge being saddled with a dice roll knocks it way down in usefulness. Toxic Gases looks like it aligns well with the warband. I can definitely see adding it in alongside Distraction. Protect The Boss feels tough to justify. I feel like in a lot of cases I'd rather just have sidestep, but maybe it'll prove more useful in practice. Overall I'm expecting this to be another team that is hungry for Trap / Pit Trap and probably encroaching shadows. Anything that adds to the chipping away at fighters from the safety of range. Missed this earlier! It's got some big potential as a high risk high reward play. Get into adjacency with two fighters, swing it twice, land two kills in the best case. I'm eyeing Nullstone Spear as a more mild yet reliable/safe alternative. Two range will make the reaction effect more likely to go off and a damage upgrade layered on top could get pretty mean (though this is starting to enter combo territory where the odds of drawing all the right cards is lower and lower). Mesmerizing gaze feels worth messing around with, though I am skeptical about it. You'll only take it if you're already taking transfixing gaze and you'll probably want at least 1 push card in the deck to try and mitigate the adjacent requirement. At that point though your gambits are going to be getting very strained in a team that looks downright hungry for gambits since you need to splash in heals for inspiration (Healing pulse is a great call out as an avenue for inspiration). Initially I was worried about the inspiration condition, given that I don't think stacking healing effects in a deck is generally a good idea (particularly for fighters with 3 wounds), but looking again I'm not as concerned now. The inspirations don't appear to be a make or break for most of these fighters. Ylthari picks up +1 move and +1 damage on her spell attack action Ahnslaine picks up +1 defense on dodge and +1 range to her bow Gallanghann picks up a questionable target all adjacent attack action on 2 fury and 1 damage Skhathael picks up +1 dice on his attack and cleave I suspect that Ylthari and Skhathael are going to be the typical top targets for inspiration. The other two will have their uses but feel more niche. The unique reactions across the team also just look like a ton of fun. I think the potential of Gallanghann and Skhathael's reactions in particular are easy to miss. Ylthari can crit spellcast into a free heal and inspiration if she isn't inspired already. Ahnslaine can net you a free attack (though the circumstances are pretty narrow) Gallanghann can crit defense to deal 1 damage (don't forget that you can roll defense even if your opponent totally whiffs!) Skhathael can crit attack roll to deal 1 extra damage (which goes off even if the target successfully defends!) Can't wait to see this team hit the board. Just what we needed. Even stronger Stormsires. I had a feeling this was the case as I thought about it more. I've been on the road and haven't been able to look at the card. Just read KTG again and sure enough you're correct. Apologies for not being clear @PJetski, I meant that I've made use of Bag of Tricks in my games as Zarbag's, not against them. It feels to me like it could potentially be viable on Thorns, but I'm not truly sure since I've barely put any games into them. Though I'm confused though as to why Keep Them Guessing would work against Bag of Tricks. Activating BoT is still a unique action and would therefore count towards KTG going off in the event that you have both at the same time. An aggressive mulligan can in theory get the job done, but I think BoT is more about having a layer of safety to draw what you need without having to throw out a quarter (give or take depending on deck size) of your power deck. This is very fair. After looking at your gambits again I can see why there's not really much in the way of critical draws that you'll need to reach. I was often using my BoT to secure Transfixing Stare or Frozen In Time to lock down key threats. Alternatively it was used to secure Supremacy/OOWO through drawing cards like Faneway Crystal, Hidden Paths, Quick Advance, etc. in the face of high aggro teams that push deep into my side of the board early on. That all being said, I can see where giving up a gear slot for it in your deck in particular is painful. You're still looking to get in there and fight with several of your specific fighters, whereas with Zarbag I'm generally pretty fight-averse given the poor combat stats across a lot of the team and running objectives that don't require me to actually kill something. Great deck @Requizen. Countercharge and Mirror Move are both clever tech cards for the Thorns. I like the idea of snagging free inspirations prior to going into some attack or charge activations. Also glad to see the hold any three objective cards in it. Have you messed around with Bag of Tricks at all? I've found it to be a gamechanger in a lot of my Zarbag's games. Thorns feels like it has the bodies to make use of it. Also curious about what matchups you find toughest for this deck. Flex thorns has always struck me as strong enough to handle anything that another deck can throw at it. Random suggestions I can think of that I've kicked around for building decks for this warband: Run Rebound and Last Chance. I dislike dice roll cards generally but in a post restricted Sudden Growth / Deathly Fortitude world stacking on wounds is not likely to keep your barbarians alive. Use Spoils of Battle. This is basically inspiration strikes for this team. Pile on the ploys and upgrades that add extra attack dice. In all of my games so far against this team it's pretty typical that a model that charges is dead. You need those charges to hit so you aren't ineffectually bleeding out glory. I know this has been discussed but it bears emphasis: Oath of Conquest is amazing. I don't see any reason not to have it in every Godsworn deck. Can you link where you're seeing the reference to being on guard? I recall this being true when the last round of FAQs was released, but then being very quickly changed to reflect that their inspired state is not actually "on guard" This is the only text I can find left in the Designer's Commentary that references Ammis' and Rastus' inspired defense: STORMSIRE’S CURSEBREAKERS – FIGHTERS Q: How does Cleave work against Ammis and Rastus from Stormsire’s Cursebreakers when they are Inspired? A: When an Attack action has Cleave, the target cannot count Block symbols as successes in their defence roll. This means that Ammis and Rastus, once Inspired can use Dodge and Crit symbols (and any relevant support symbols) but not Block symbols as successes when they are the target of an Attack action with Cleave. Almost all of them. Mollog's mob does not feature any spellcasting, which leads me to strongly believe that the KO team will not have any spellcasting either. Feels like I missed some rumors out there somewhere. 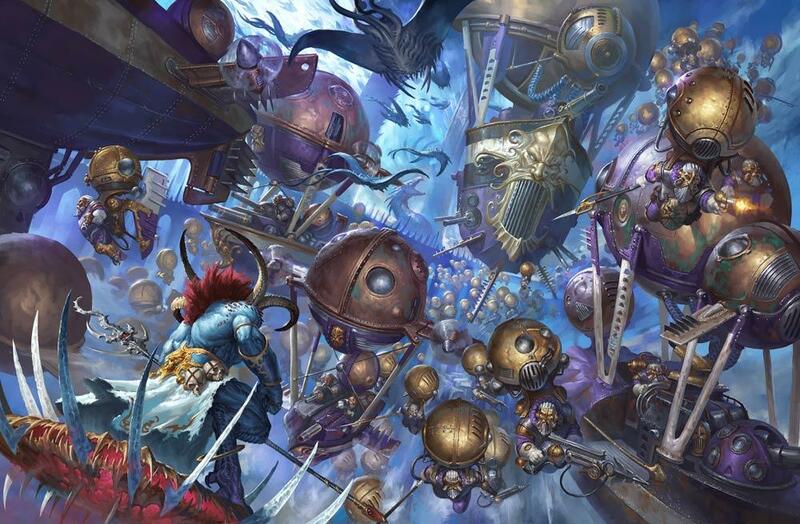 Have there been substantial rumors that a new battletome is eminent for KO? I'll admit that I'd be surprised if we got one before factions with even older battletomes such as Sylvaneth, Seraphon, Fyreslayers, and Ironjawz. Our battletome (despite it's unfortunate state) isn't quite even 2 years old yet. It doesn't really feel like the Underworlds KO warband is any indication of something to come since the treatment of it has felt very standard when it comes to teasing/revealing Underworlds teams. Nightvault has been quite consistent so far with Reveal Models -> Reveal some cards -> Release. I haven't seen any indication that marks them as heralding something bigger. Imbalance in the Nightvault set? I'm in full agreement on this. I'd rank the skellies as being one of the toughest warbands to play effectively (If not the toughest). Magore's Fiends on the other hand are much more plug and play whilst remaining very competitive. @Sleboda awesome to hear that Supremacy has been a strong inclusion. I had another round of Zarbag games this weekend where Supremacy and Our Only Way out were scored with regular frequency, barring a game where my opponent managed to kill 5 of my fighters in turn 1... that was a pretty brutal sweep. Fully believe that both cards are viable in top level competitive play for specific warbands. Not completely sure what scenario you're describing @Twisted magpie. It is possible to trigger Aggressive Defence and My Turn off of a single attack action. I'm not sure if that's what your asking, but here's an example where this can happen: Enemy starts an attack against one of your fighters You play Aggressive Defence in response Enemy attack is successful, which damages your fighter You play My Turn, which allows a push and attack You then make the Aggressive Defence attack (assuming the enemy fighter who triggered the Aggressive Defence is still alive) @Tutenkharnage you're correct that if you take the Aggressive Defence attack then you've lost your ability to trigger My Turn. It is however possible to trigger My Turn before Aggressive Defence kicks in if your opponent does manage to hit you.